What New York needs now is another opera company. You might think I could find a better time to float that thought. After all, the carcass of New York City Opera is still twitching, having declared bankruptcy after 65 tumultuous years followed by five miserable ones. The sums it failed to scrounge—$7 million to finish the season, $20 million to plan ahead—are pocket lint to the wealthiest arts donors. If they didn’t swoop in to help a critically wounded company, maybe the art form has become too rarefied even for the elite. Or you might deduce that New York has all the music drama it can digest. The Metropolitan Opera has just rumbled glamorously back to life. The dowager queen of the lyric stage is busy trying to be the People’s Opera, with a free live screening of opening night to the Lincoln Center plaza and Times Square. Live video broadcasts of Saturday matinees bring exciting glottal close-ups of the world’s great singers to movie theaters all over the globe, at roughly the cost of a large pizza. Then there are Juilliard’s virtually professional-grade student productions, imported one-offs at BAM, and an assortment of miniature outfits like Gotham Chamber Opera, which produces fine small-scale spectaculars. Who could ask for anything more? Well, I could, especially after attending all four productions of the Met’s first week. Each has its glories: the shapely melancholy of Anna Netrebko in Eugene Onegin, the return of James Levine in Così Fan Tutte, William Kentridge’s brazen visual inventiveness in The Nose, and, most of all, the torrid yet dexterous Sondra Radvanovsky in Norma. Missing from them all, though, was the fearlessness and freshness of City Opera at its best. There’s still a role—and an audience—for a second opera company in New York, one that isn’t hobbled by a long rap sheet of disappointments. Like anyone who attended City Opera regularly for decades, I have my gilded memories. We can mourn without romanticizing, though. Productions there could be infuriatingly abstruse, ragged, mis­guided, and redundant. The company sometimes blazed paths better left untrodden. Despite that saga, though, New York should still be able to sustain a nimble, compact, and relatively low-cost alternative to the slow-moving juggernaut at Lincoln Center. The Met opened its season with a production of Tchaikovsky’s Eugene Onegin that managed to be both sleek and messy at the same time. When the director, Deborah Warner, pulled out just before rehearsals started, Fiona Shaw stepped in, deflecting calamity into mere confusion. Crowds mill chaotically around the vivid and slightly shabby farmhouse (designed by Tom Pye) and principals find themselves shouting across an empty stage. At the center of all this vagueness is Anna ­Netrebko, in whom a deluxe voice is welded to an actress with scant interest in any character but herself. Fortunately, the famous letter scene is a triumph of heartfelt narcissism. Young, naïve Tatiana spends all night emoting on paper to a dead-souled man she doesn’t know and could never understand. This is the kind of material Netrebko was born for, and she sings it with style if not heart. A week later, the Met brought back John Copley’s bargain-rack production of Norma from 2001, as a vehicle for the phenomenal Sondra Radvanovsky. After years of making do, the Met finally has found its normative Norma. She has been singing at the Met for nearly two decades, steadily working her way from yeoman to headliner, but this role vaults her into the tiny corps of genuine divas. Radvanovsky does not have a Tiffany timbre—at times the silvering wears thin—but she sings the famous aria “Casta Diva” with an alchemist’s finesse that many of her predecessors can only fantasize about. Long-breathed pianissimos plume fragrantly into the air, gathering into gale-force blasts of sound. The aria is not the self-pitying lament that many singers make it; it’s a priestess’s invocation, and Radvanovsky, unspooling a slender filament of breath, gives it a serene, exquisite dignity. 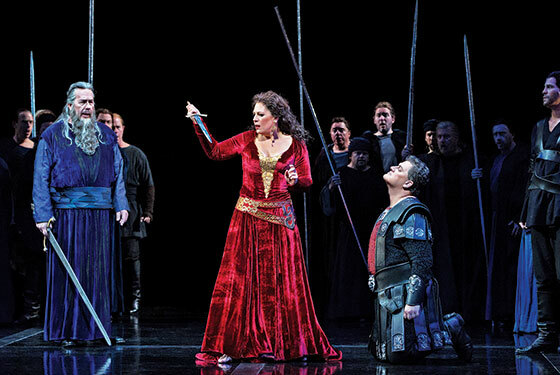 Such splendid moments are not enough to fuel New York’s sole superpower of ­opera. The Met relies more heavily on its meager stock of stars than on artistic vision—a situation underlined by the presence, after a two-year hiatus, of music director James Levine, who conducted Così Fan Tutte with an abundance of nuance but little fire. The company’s attitude toward its putative leader is the same as it is toward fly-in divas: Thanks for showing up; we’ll take what we can get. If I were in the habit of supporting the arts with multimillion-dollar checks, bereft over City Opera’s disappearance and frustrated by the Met’s complacence, I would get on the phone with the Hungarian conductor and sometime stage director Iván Fischer. This past summer, at the Mostly Mozart Festival, he conducted his own fabulously imaginative and vivaciously executed staging of The Marriage of ­Figaro. It opened as if the hall were his drawing room and the audience his invited guests. Fischer ambled around smiling and chatting, until it was time to give the signal and the overture was served. The production dispensed with sets, except for a few costume racks. Gowns soared above the stage, then dropped when a character needed to change into one, often in mid-aria. The effect was electrifying. That’s the kind of productions I want the next New York opera company to offer: frugal, portable, dynamic, and memorably alive.